J. W. Pepper Snare DrumOne of the more common drums in marching bands and drumlines and the primary drum of a drum set... . Donated by Gordon Peters Many different types of concert snare drums have existed as manufacturing techniques and mechanical developments evolved. Shown here are three snare drums from companies that either no longer exist or that have ceased to manufacture drums. This type of drumA hollow cylindrical shell of any size that has a head stretched over one or both ends and is b... was most often found with concert bands or smaller theater orchestra ensembles, although they often came with a leg brace and sling and could be used for marching. 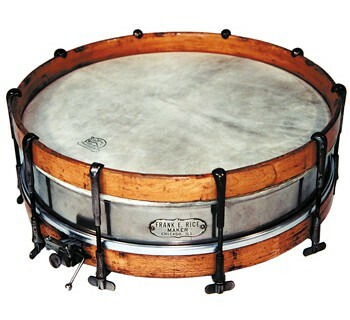 Lyon & Healy Snare Drum . Donated by Gordon Peters – A 4-inch by 15-inch wood-shell drum, dated August 6, 1912, on an internal label. 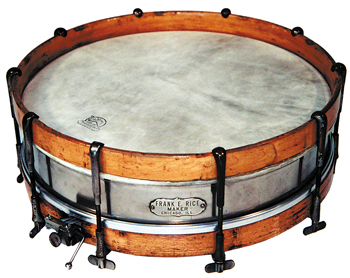 Although the label identifies the drum as Lyon & Healy, the design is that used by the Duplex Mfg. 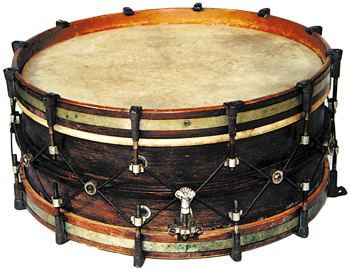 Co. for drums provided to various musical merchants in the early part of the 20th century. 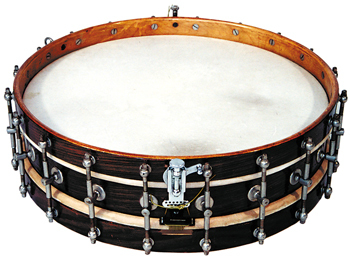 The 20 lugsThe tension rods (or screws) that hold the hoop and drumhead onto the drum., with rods that join to metal inserts in the wood counterhoops, provide separate tension for the heads. This drum has been modified with a new strainer and a set of Hinger snares.